I am so excited to share with you the blueprint, or the plan that you can use to implement the maintenance process on your database. If you were daunted by this task before, afraid to proceed, because you didn’t even know where to start, then this article is for you. If you had an idea on what needs to be done, but didn’t actually put a plan together, then this article is for you. If you already have a plan, and want to verify you covered all the steps, then this article is for you. I am showing you step by step the exact process I use, to reorganize tables and rebuild indexes in an Oracle database. I am taking the guesswork out of the process. You can customize this plan to your needs, as I am sure, there could be steps that don’t apply to your database. 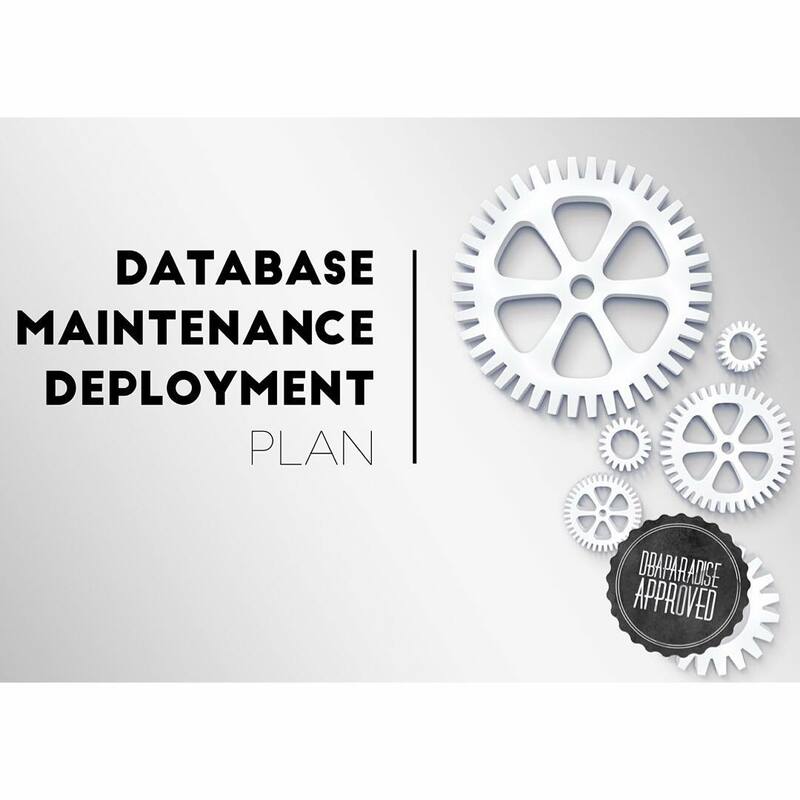 This is the last part of the 3 part series for Oracle Database Maintenance. Reorganize Tables And Rebuild Indexes, The Oil Change For Your Database, discussed the importance of reorganizing tables, and rebuilding indexes, why and when you would do it. 7 Things To Consider When Reorganizing Tables And Rebuilding Indexes, reviewed the main challenges that can rise during the reorg process, such as: partitioned tables, IOTs, tables with LONG and/or LOB data types, indexes. Today, I am putting it all together, and share with you, the Step By Step Deployment Plan, for reorganizing tables and rebuilding indexes. You will need to create your own scripts, and that part is easy, once you know what scripts to create. When you have a plan, or a “blueprint” for a particular task, the task becomes easy, it is not daunting anymore. What challenges will you encounter? I don’t know and you don’t know it either, until you actually do it. Enjoy my friend! If you have any questions or feedback, feel free to leave a comment in the comments section, or email me! The bottom line is, you don’t want users, applications, and other process touching the tables that you are working on. It is critical that you are in the right environment when you proceed. At times it can be confusing as to where you are running the scripts, especially when you have multiple windows open. My preference is to run the scripts right on the database server. This is the step where you think about everything that could reside in the tablespace that you are reorganizing, or any objects that you are working on. This is where the scope of this deployment plan can be increased or decreased. Each script generates a RUN script, that will be run in a Step7. I usually prefer using the naming convention of tablespace_name_OLD, this way it is easy to spot it at a later time. If you don’t really care about tablespace names, and you just start with new names, then this step can be ignored. You need to create the tablespaces where the tables will be moved to, and indexes rebuilt. This is the step where you are actually doing the work. Everything up until now, lead to this step. You will run all the run_* scripts generated in Step4. You need to confirm that all indexe that were usable, are still in a usable state, and that no index rebuilds got missed. If you decided in Step5 to rename the original tablespace to _OLD, now is the time to confirm no objects reside there. If your check is positive, and no objects exist in the tablespace, it is safe to drop it. The database maintenance could invalidate some objects, such as synonyms, views, procedures. These objects need to be compiled. You need to confirm that all the objects that were valid prior to your deployment, are still valid after. When you rename the tablespace to _OLD, the default tablespace for users, also gets renamed to _OLD. Users’ default tablespace needs to be altered from _OLD to the new tablespace. The output file can be compared with the log file generated in Step3. Now you can create some nice reports for management. You can create a comparison between tablespace sizes, table and index sizes before and after the reorg process. Management likes to see reports, and numbers. You can show them that you reduced the database size by X%. You created new tablespaces and dropped old ones. Take a backup of your database! You Did It, you got to the end of the deployment, and your database maintenance has completed! Great thanks. Good explanation of each steps involved. Thank you! I am glad you enjoyed the article! Where are the scripts if I may ask ? Hi Sam, The scripts are not provided. The plan and all the things you need to consider when going through the reorg process, that is provided. Could you please provide the scripts as well. The scripts would be needed to be build on a case by case basis. I can write a final article for this series, with some scripts that can be customized! Hi Prabhath, I will put something together at one point to share. Hi Bilal, will put a post together shortly! Thanks for your patience! Hi Zeeshan! I don’t have generalized scripts to share, I only have specific ones I used for clients! Excellent article, Can you please share the scripts. Hi Kumar, thank you for your kind words. At the moment I don’t have scripts for sharing, I only have some custom script that I have used. I might come up with something later and post it on the blog. This is great step by step, thanks. Let me add my 1¢ here… let’s say that space is a constraint, and that you cannot execute all the steps for all objects… Where should we start from? Well, my approach in those cases is to find extents placed at higher block_id for each datafile, so once you have reorg segments related to an object (I mean table, lobs and indexes) you can go with a downsize of datafile/s from where the segments were placed (better if there is a new tablespace as destination of each reorg). Having said so, sometimes you will face that only few and little extents are “freed” from high part of the datafile, and downsize is then also little, then you have to find “big” chunks of free grouped extents (dba_free_space) and work on moving segments with extents from that big chunk to the high part of the datafile/s. Thank you for these steps. Wondering how would you estimate the time needed to complete this effort before starting it? That will help planning for the maintenance window. Secondly, can you please share some sample script as well? Even if you have some specific scripts, find/replace the actual tables/tablespace names with some fictitious names would work. You would estimate the time, by first running through the process in the test environment. That is a good start! I’ll see what I can do for the scripts! I got lots of requests!